We present new geochronological evidence of latest Palaeoproterozoic–earliest Mesoproterozoic magmatism in the Telsiai Deformation Zone, NW Lithuania. Employing the laser ablation inductively coupled plasma mass spectrometry (LA-ICP-MS) at the University of Tasmania, Australia, we demonstrate that a granodiorite, which had previously been considered to belong to the 1850–1820 Ma Kursiai charnockitic batholith, has a U–Pb zircon age of ca 1.62 Ga. The weighted mean Pb207/Pb206 age obtained from eight concordant zircon grains is 1625 ± 6 Ma (MSWD = 0.6), while the upper-intercept concordia age is 1619 ± 27 Ma (MSWD = 0.56). Like similar ages of granitoids from several small intrusions in Estonia, this once more indicates extensive melting of the crust at that time. 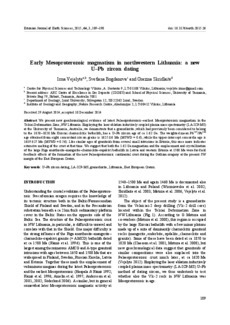 We suggest that both the 1.62 Ga magmatism and the emplacement and crystallization of the large Riga anorthosite–mangerite–charnockite–rapakivi batholith in Latvia and western Estonia at 1580 Ma were far-field feedback effects of the formation of the new Palaeoproterozoic continental crust during the Gothian orogeny at the present SW margin of the East European Craton.